Part of The Airdri Group, Airdri Ltd was founded in Oxfordshire (UK) in 1974 by business partners Peter Philipps and Peter Allen; both experienced and entrepreneurial electrical engineers. 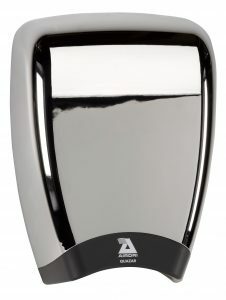 At a time of significant advancement in the hand drying industry they identified that there was a gap in the market for highly reliable, energy efficient hand dryers to meet the varied requirements of the washroom environment. 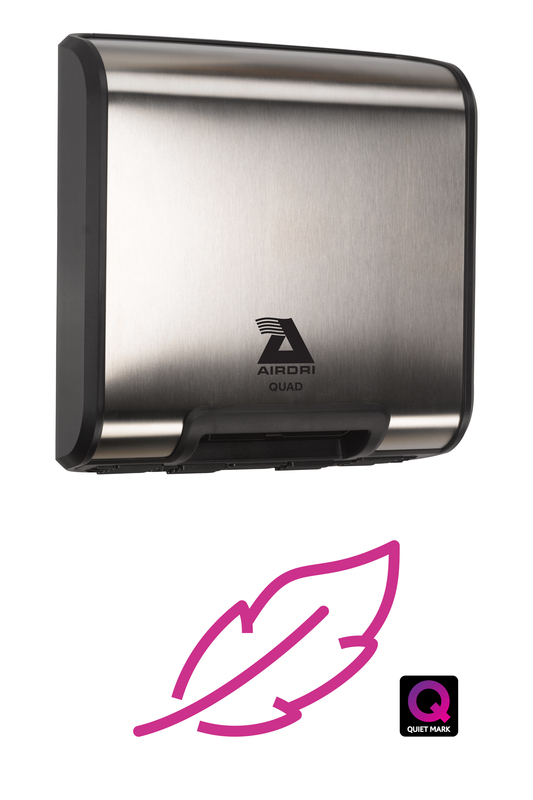 This initial spark of imagination is realised in our ever-growing hand dryer range – high-speed dryers for busy washrooms, durable, resilient dryers for high traffic washrooms or dryers with a slim profile to meet the requirements of disabled facilities. Our ongoing programme of research and development into sustainable product development has resulted in Airdri setting the industry standards for low noise and reduced energy consumption and has helped us become well-known for producing some of the most reliable hand dryers on the market. 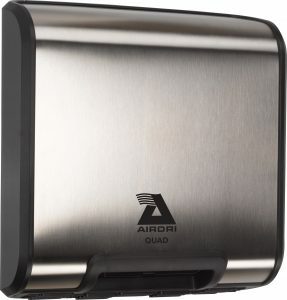 Airdri was the first hand dryer manufacturer to be awarded the Quiet Mark by the UK Noise Abatement Society and we are committed to incorporating sound level reduction in our ongoing product development. Our ADA compliant designs for disabled facilities ensure that no one need be excluded from the washroom. Both our Quazar hand dryer and our new jet dryer, due to be launched in September 2017, have GreenSpec PASS certification in recognition of their low energy consumption – making Airdri the perfect choice for eco-conscious airports. 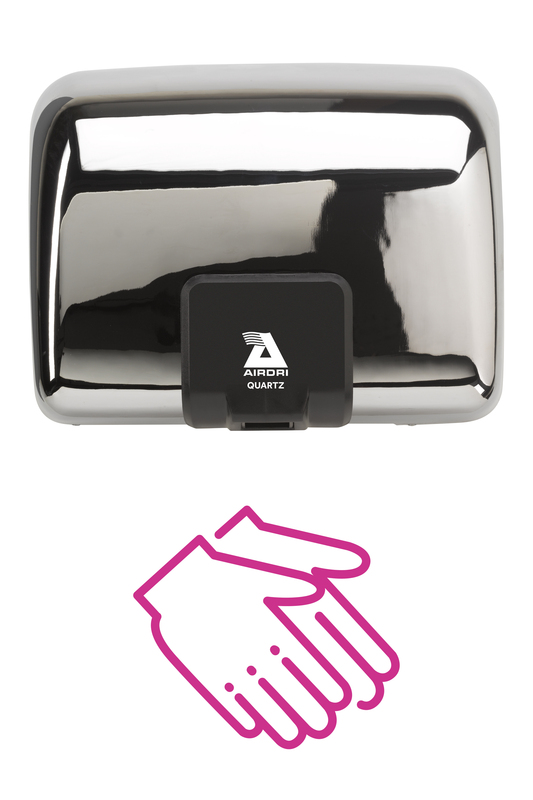 The steadfast reliability of Airdri hand dryers is not just a coincidence; it stems from the hard work of our engineers over the past four decades in creating our own bespoke motor brushes that outlast all others by up to five times. The brushes are easy to replace, so even after many years of use your hand dryer will operate as if it were new. A long lifespan, robust designs, low energy consumption and low sound levels have enabled us to grow into a hand dryer brand that you can trust. No tricky maintenance, no filters to replace, just durable and reliable hand dryers that continue to work well, years after installation. As we come to better understand the effect that our abundant use of electricity has on precious natural resources such as coal, gas and oil, there has never been a more fitting time to consider the impact of our daily activities on the environment. The Department for Business, Energy & Industrial Strategy estimates that 29% of greenhouse gas emissions in the UK come directly from our energy supply, and 17% from our businesses. As our awareness increases, so must our responsibility to protecting the environment. 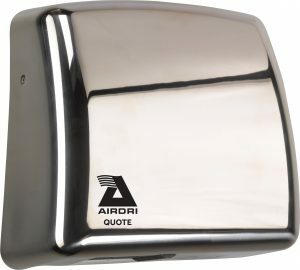 Airdri has a long, historic commitment to energy efficiency – it has been a core value since we began designing hand dryers in 1974. 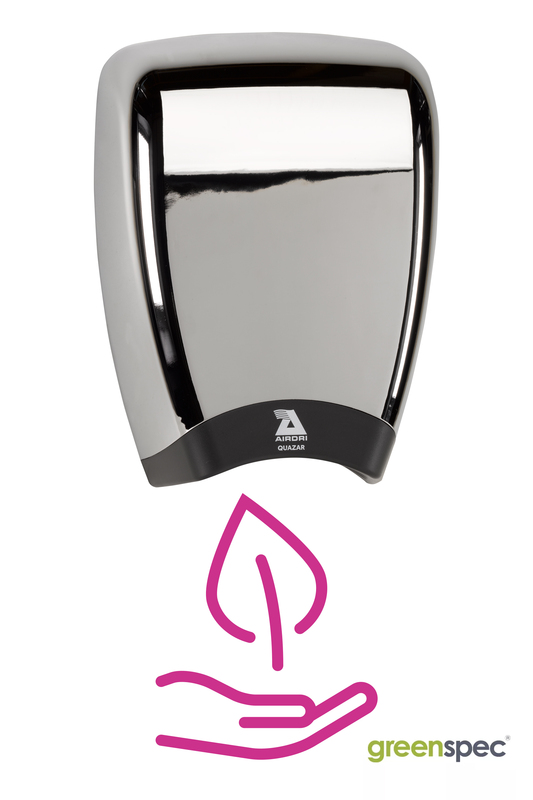 In establishing our expertise in this area we have come to develop some of the most energy efficient hand dryers on the market. The Airdri Quazar runs at only 1.0kW and has been awarded GreenSpec PASS certification. Our new jet dryer, soon to join the Airdri family, runs at an astonishing 0.2 kW – making it the lowest wattage hand dryer in the world. Not only does switching to energy efficient hand dryers reduce carbon emissions and help to protect our environment, they can save you money too. 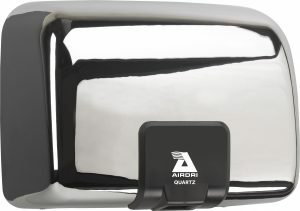 On average, a standard hand dryer costs £157 a year in electricity usage, but Airdri’s newest models cost less than £66 per year to run. Our new jet dryer will cost just £6 per year. There is also a remarkable cost saving to be made when compared to paper towels. It costs around £1,460 per year to supply a busy washroom, and soiled towels ultimately end in landfill. Designing hand dryers that are inclusive to all users is one of Airdri’s core values, and part of this is a commitment to sound level reduction. As hand dryers become faster and more powerful, there is a tendency for them to become lounder, which can lead to a negative experience for some users. Our extensive research has helped us understand that small children, the elderly, people on the autistic spectrum and people with hearing impairments can be intimidated by the excessive sound of some hand dryers. Some will avoid using hand dryers altogether, which can affect hand hygiene after using the washroom. 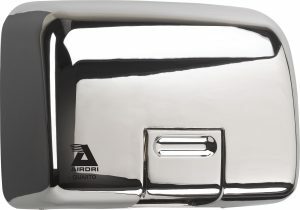 However, at Airdri we have used our 40 years’ experience in hand dryer design and manufacture to create some of the quietest hand dryers on the market, without compromising their performance. We have a long-established relationship with the UK Noise Abatement Society which we continue to value and develop. 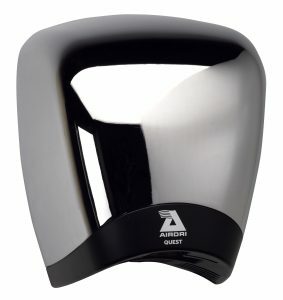 The Airdri Quartz was the first hand dryer in the world to receive the Quiet Mark in 2012, and helped shape an industry standard for quiet hand dryers. 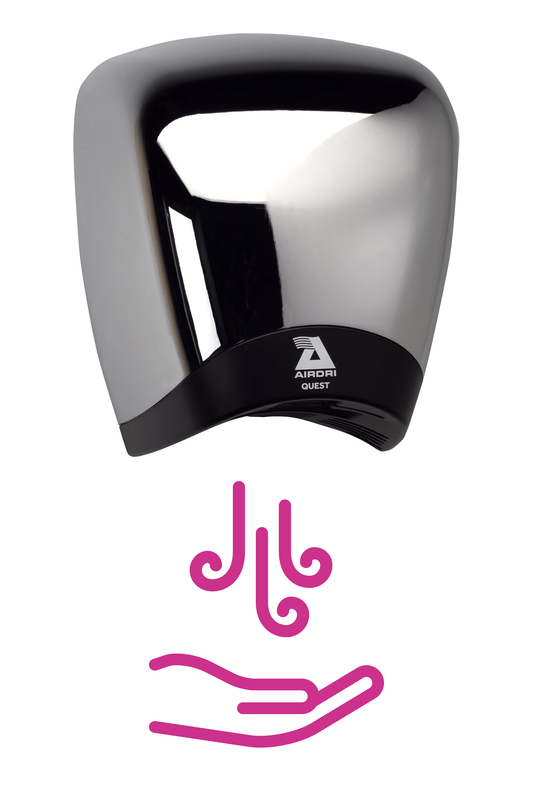 Since then, four of our biggest selling models have been awarded the Quiet Mark and are renowned for being some of the quietest fast-dry hand dryers on the market. Great Britain possesses the largest design industry in Europe and is home to some of the most prestigious design museums and fashion houses in the world. We rank fourth in the world for design exports and UK designers and businesses win many global design awards annually. As a country, we have a rich and colourful history of design dating back to the mid-18th Century and the first Industrial Revolution, when major changes occurred in manufacturing and technology. At Airdri we are not only proud of the socially inclusive way our Engineers approach the design phase of our hand dryer product development, but also of our commitment to uphold the Great British design values of quality, simplicity and functionality that are recognised internationally. Users seldom think about what goes on underneath the covers of our hand dryers when they use them. However every component, from the motor brushes to the filters, has been carefully designed to provide the efficiency and user comfort we are renowned for. We continue to design all of our hand dryers in our lab at our headquarters in Oxford, UK with our Engineers relying on the established Great British design principles, whilst taking the time to innovate and create greener, bolder and more reliable hand dryers.